The quickly-transpiring events of this historic day in the life of the church of St Louis and beyond reached their coda within the hour when, in what feels like record time, the seven consultors of the 560,000-member see elected Auxiliary Bishop Robert Hermann as archdiocesan administrator pending a permanent successor to Archbishop Raymond Burke. One of 15 children raised on a family farm in rural Ste. Genevieve County, the gentle, "much revered" career pastor and high-school teacher, who turns 74 in August, has served as the Gateway City's lone auxiliary since then-Bishop Joseph Naumann's 2004 promotion to the archdiocese of Kansas City in Kansas; as auxiliary and lead vicar-general, Naumann temporarily oversaw the St Louis church for four months between the late 2003 departure of then-Archbishop Justin Rigali for Philadelphia and Burke's January 2004 arrival. 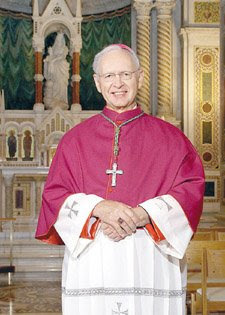 Ordained in 1963, Rigali first named Hermann vicar-general in 2002 following the departure of another of his auxiliaries, Bishop Michael Sheridan, for Colorado Springs; in recent years, the bishop's shared the administrative burden alongside Msgr Vernon Gardin, the former rector of the city's "New Cathedral" who had been widely expected to be named an auxiliary to Burke given the needs of the archdiocese. As an elected administrator, Hermann is prohibited from making any innovations in the governance of the archdiocese. He may make personnel moves, but cannot name stable pastors until a year has passed from today's date of vacancy; any parish heads named by an (arch)diocesan administrator before that point can only be parochial administrators themselves. The party chiefly responsible for preparing a detailed report on the vacant see for the apostolic nuncio -- the first major part of a succession process -- the administrator's mandate ceases on the installation of a new ordinary. SVILUPPO: Fullvideo of this morning's Burke presser can be found here.